When I travel, even to towns and cities I have visited before, I am always curious to find a delicious meal at a new destination. And with Portland the nearest metropolis area to where I call home, the culinary curious city is a gem to explore. And so I found my way to Måurice just off of SW Burnside within one block of the famed Powell’s bookshop. As a Francophile and a bibliophile, the pairing was ideal: peruse the shelves for new and used books, upon becoming exhausted, refuel at nearby Måurice, return to Powell’s if desired. A dream! The talent behind this understated must-visit pastry destination is Kristen D. Murray. A pastry chef with Lucier, Fenouil, Paley’s Place on her resumé, she began making a name for herself in 1996 while working in San Francisco at Alain Rondelli, ultimately being part of the team that would earn four stars (the highest possible in the Bay Area). Then it was to Boston where again, she earned acclaim. But as she revealed in an interview in 2009, her dream, her focus of attention, was to open her own “little sweet shop”. And with her dream now a reality, let her attainment of precisely this dream and in so doing creating a signature destination unlike any I have yet to visit, be inspiration to us all. Måurice opened in 2014. 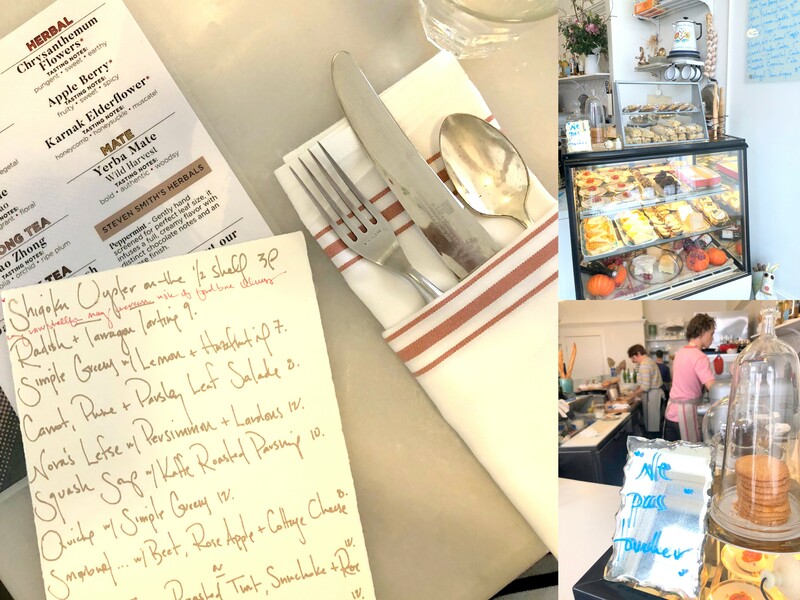 Described as a pastry luncheonette, the menu changes daily (see the hand-written menu on the day I stopped by below), and the pastries exhibited reveal Murray’s talent in her area of expertise. Not only is the fare thoughtfully crafted, but the details in the dishware, flatware and white décor are unique vintage finds that grabbed my applause, followed by a roar of appreciation upon tasting the flavors in the food prepared in the open kitchen. Open from 10-4 Tuesday through Saturday (and nope, they do not take reservations), stop by and enjoy a casual, cozy, yet sophisticated palette pleasing meal. I enjoyed the apple, brie and parsnip quiche, and hands-down, it was a quiche to surpass all quiches from my recollection for the best of reasons: much like buttery silk, the flavors, crust and simplicity satiated my appetite and left me reconsidering the heights such a classic French dish could reach. Of course, I couldn’t leave without having dessert. The most difficult part was choosing which to enjoy. Offering seasonal creations, I decided upon the dried pear and pistachio tart (seen below). Again, spectacular. Just as important was the warmth of the service from all four of the employees present while I dined. 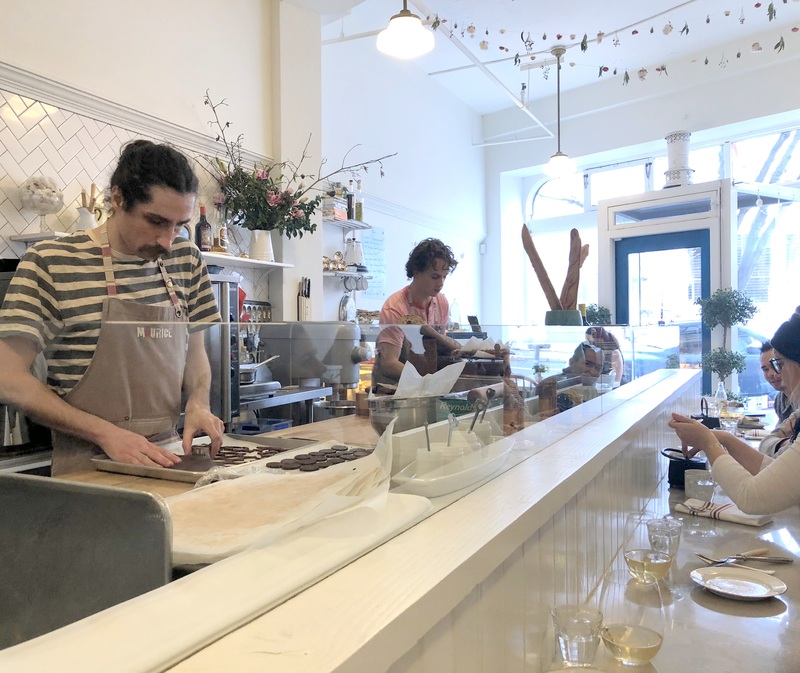 From the host/waiter to the bakers, each paid careful attention to the food they prepared as well as the customers who walked through the door. 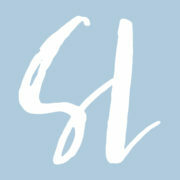 Dining alone is something I sincerely enjoy, and I was able to savor a leisurely meal in a lovely, inviting atmosphere. 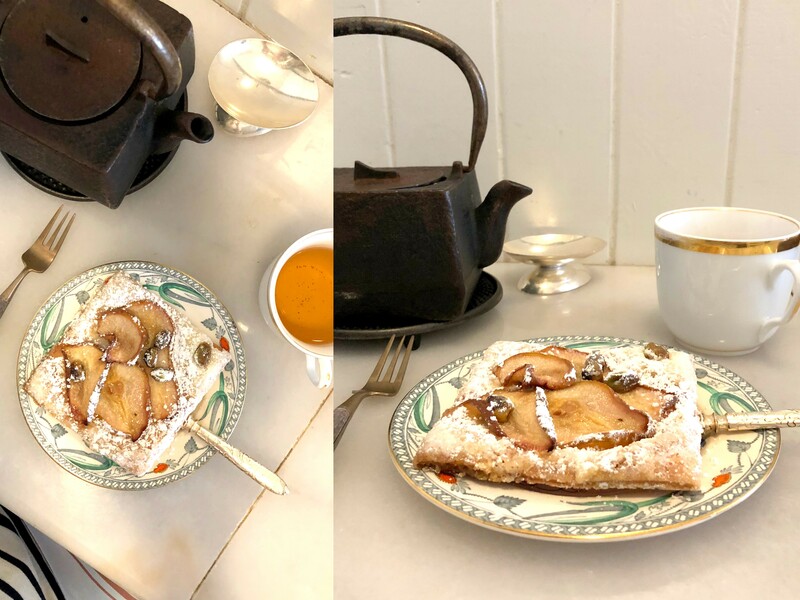 From the sturdy cast iron tea pot full of Darjeeling tea to the petite dessert fork and antique plates, I was transported to many a European cafe of which it reminded me of (of course with its own Portland signature) and look forward to returning again. 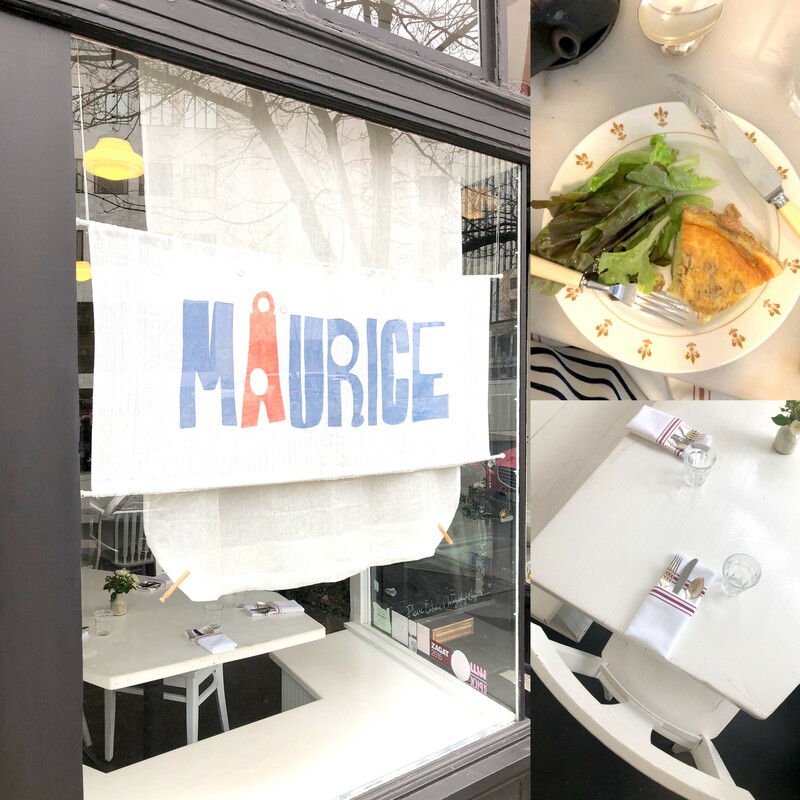 The next time you are in Portland and have an inkling for good food and the comforts of a nearby bookstore, I have the perfect match for your: Måurice + Powell’s. Thanks for this information, Shannon. As a native Oregonian and Portlander, now living in the Loire, I’d love to pay a visit on my next trip “home.” Sounds delicious. Especially the double-chocolate cookie with cinnamon. Maurice is not far from the salon where I used to get my color done. Don’t know how in the world I missed it! 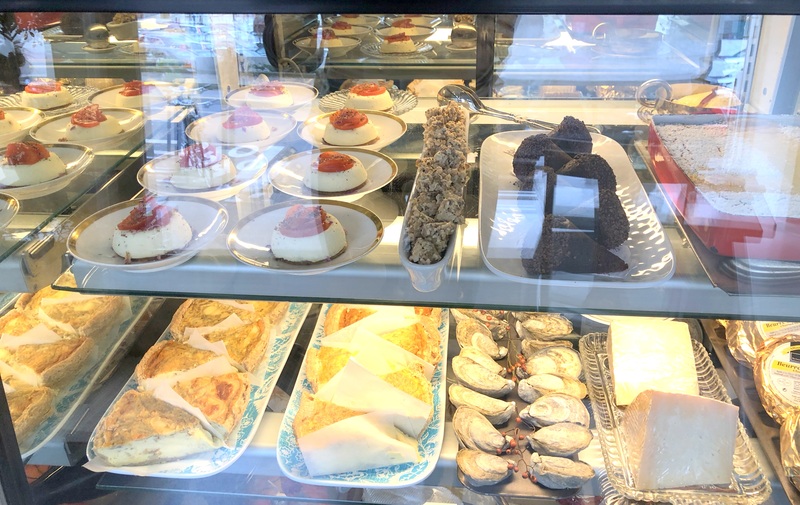 Next time…..
My office is a few blocks from Maurice’s — will have to stop in for lunch!